Energy Efficiency - People's Self-Help Housing, Inc. The cost of purchasing a house is only part of the cost of owning a house. Even with a low monthly mortgage payment, a house with high utility and maintenance bills can be very expensive to own. New homes from People's Self-Help Housing (PSHH) are not only affordable to buy, but they are also about twice as energy-efficient as standard code-built houses, which translates to significantly lower utility bills. Additionally, many features of an energy-efficient home, such superb air-sealing and enhanced moisture management, increase the durability of a home, reducing maintenance costs as well. A standard measure of a home's energy-efficiency is its Home Energy Rating System (HERS) Index. The HERS index for a standard new homes is 100. Typical new homes from PSHH score about 50, which means they use about half as much electricity. WHAT MAKES A HOME ENERGY-EFFICIENT? The most important aspect of an energy efficient home is not insulation, but proper air sealing. The many holes and cracks in a typical house allow heat and moist air to bypass insulation, making it much less effective, and in some cases useless. Not only does this reduce the comfort level of homeowners, it also degrades indoor air quality and promotes building decay. 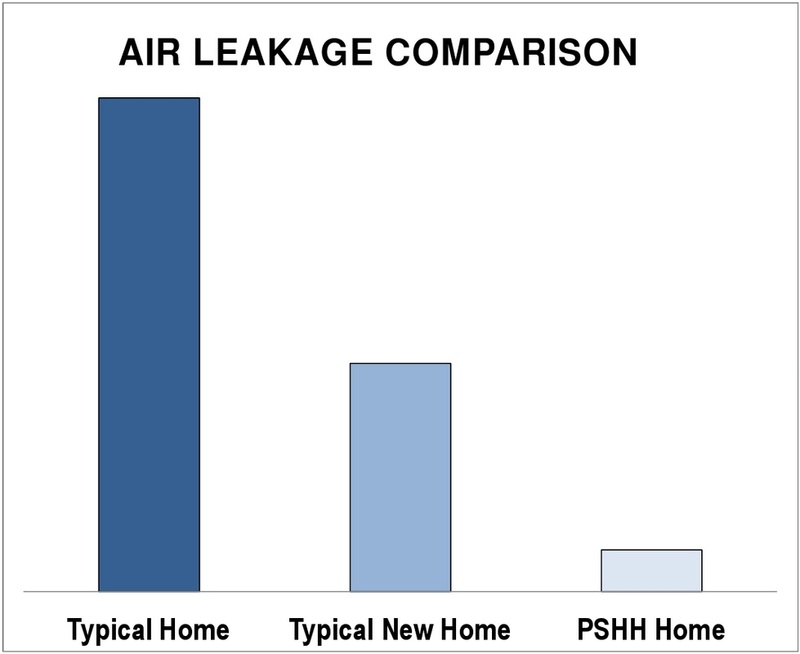 PSHH takes special care to provide a nearly air tight barrier in its homes. The result, as can be seen in the graph to the right, is a house that has much, much less air leakage than a typical house. From the ceiling to the foundation, nearly every surface between the interior and exterior of a PSHH house insulates better than its counterpart in a typical house. This is especially true with the exterior walls. The walls in a PSHH home are constructed with 2x6 studs instead of standard 2x4 studs. This difference allows for an additional two inches of insulation inside the walls. Advanced framing practices and careful planning allows for even more insulation by eliminating unnecessary wood in the walls. Any heat travelling through the remaining wood framing is slowed by a final layer of foam insulation that wraps the exterior of the walls in a continuous blanket. The resulting walls insulate almost twice as well as a standard 2x4 walls. After careful attention to air sealing and insulation, PSHH fills their homes with state-of-the-art equipment. Indoor air is heated and cooled with extremely efficient mini-split heat pumps. Hot water is provided using heat pump water heaters that are twice as efficient as a standard water heaters. That hot water is delivered through efficient, well-insulated piping to faucets and shower heads that are designed to use less water. Finally, Energy Star refrigerators, clothes washers, and fans further reduce the amount of electricity used in each home.